Energy deficit and energy poverty is a big hindrance to growth and development in the East African region. Energy supply in this region is extremely expensive restricting access to energy. This hinders the Science, Technology and Innovation (STI) development and hampers sustainable development. The availability of clean, affordable, reliable and sustainable energy is a central issue to EA. The population is heavily dependent of biomass as the major source of energy and it does not meet the demand of the growing population. As part of implementation of the ENRICH project, a benchmarking survey of STI institutions in Kenya, Tanzania and Uganda was conducted in July-December 2014, targeting key energy sector stakeholder institutions including Higher Education Institutions (HEIs) and Other Institutions (OIs). This activity looked at the Innovation Ecosystem in the East Africa - STI policies, initiatives and support services. The survey was conducted with the purpose of assessing the status of research and innovation activities and STI support mechanisms among public and private institutions with specific focus on energy access and efficiency. This consolidated report "Comparative Analysis and Recommendations to Higher Education Institutions Top Management and Policy Makers in East Africa", taking from the individual country reports (Kenya, Tanzania and Uganda), gives highlights of the findings from this activity. Furthermore, the ENRICH Comparative Analysis & Recommendations Report was presented during the International Conference "Fostering Cooperation in Energy Efficiency and Accessibility in East Africa" that took place on 13th-14th March 2017 in Zanzibar, Tanzania. 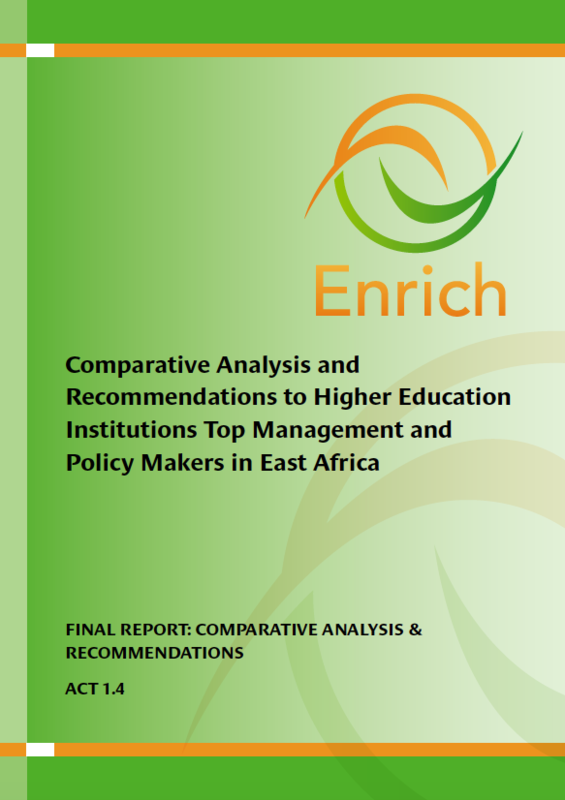 The ENRICH Comparative Analysis & Recommendations Report ""Comparative Analysis and Recommendations to Higher Education Institutions Top Management and Policy Makers in East Africa" is available at our Resources Page.